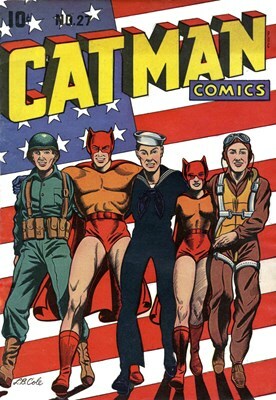 Hero Histories: The Hero with Nine Lives...Cat-Man! 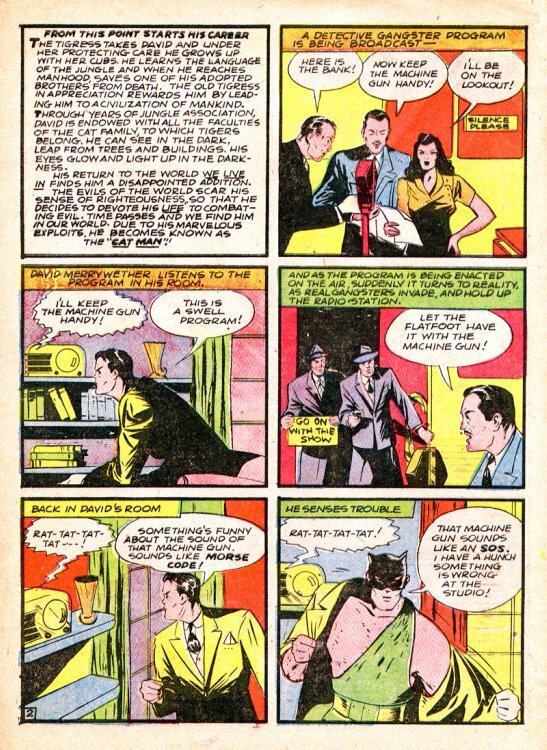 After the next (and last) issue of Crash Comics, the character was revamped and given his own book. 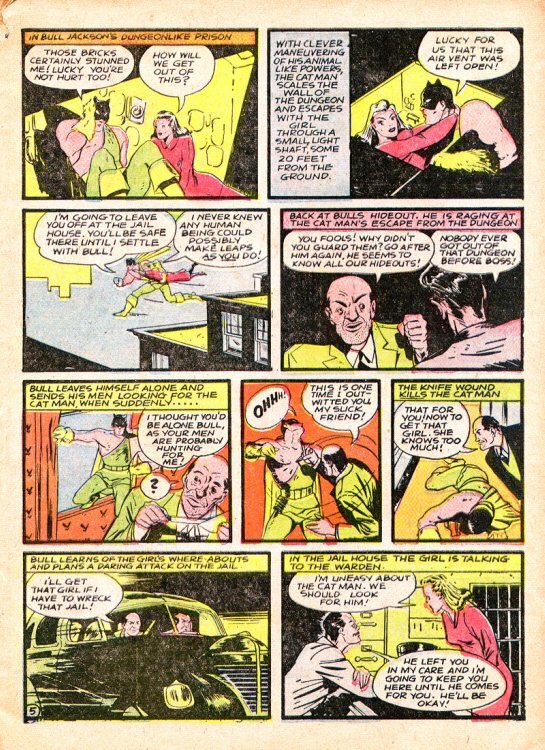 While the writer is unknown, the artist (pencils and inks) for Cat-Man's two Crash apperances was Irwin Hasen, who besides creating the long-running newspaper strip Dondi, was also a prolific artist for DC, Atlas (Marvel), Centaur, Holyoke, and Radio (Archie), doing a lot of Golden Age superhero material including Green Lantern, Justice Society, The Fox, and co-creating another feline hero, WildCat! When he gained his own title, David Merrywether doffed the furs and picked up a more traditional costume. 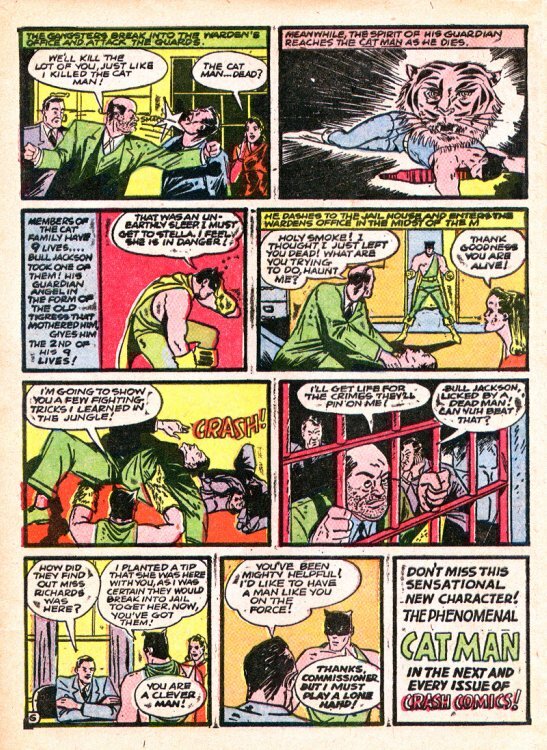 Somebody realized that the "nine lives" gimmick would only work for nine issues, so Cat-Man apparently became more cautious, since he wasn't killed and ressurected on a monthly basis after his first issue (which left him with six lives)! He retained his other cat-powers. Initally a private investigator, Merrywether made two major changes as of #5. He joined the Army, and due to influental connections, was immedately made a lieutenant and given Stateside duty. And his costumed alter-ego acquired a kid sidekick, when he rescued young Katie Conn, whose circus acrobat parents had been killed in an accident, from a life of crime with her criminal uncle. Nobody minded bachelor Merrywether "adopting" the girl, nor did they notice that Cat-Man suddenly acquired a girl crimefighting partner who went from about 12 (see top of page) to a rather voluptuous 18 (see left) in a year! 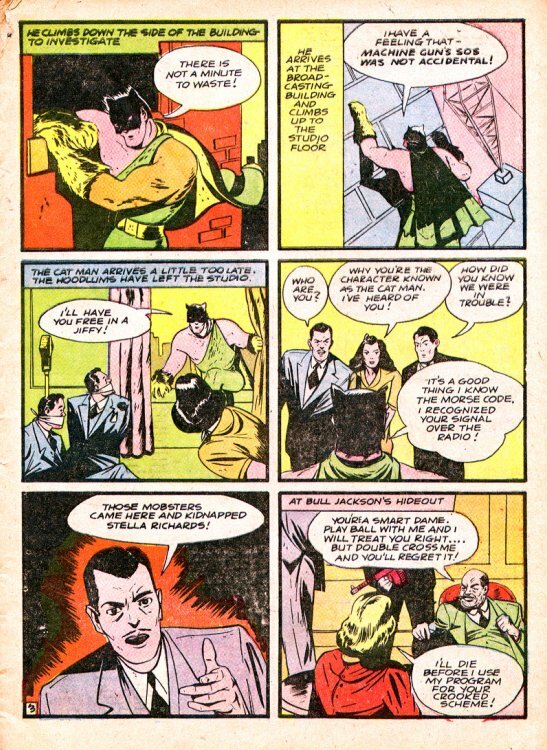 The series continued until #32 in 1946, when the publisher went out of business. 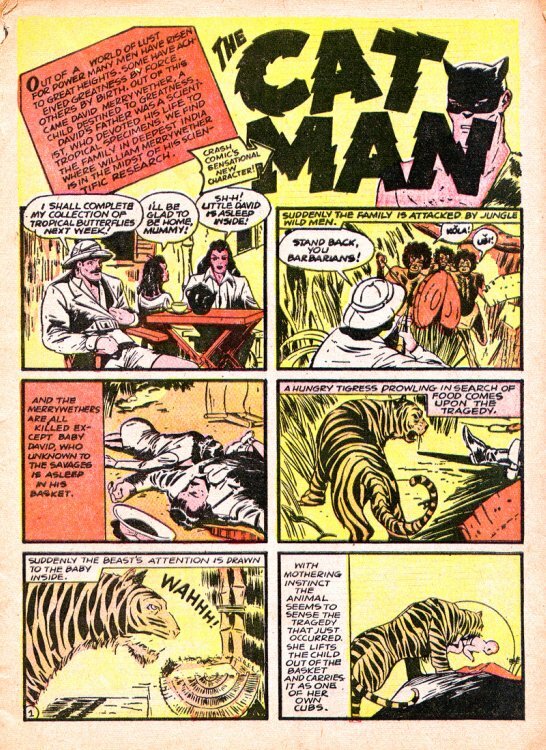 An Australian publisher who was reprinting the series did several new stories after the supply of American-produced material dried-up, but that didn't last long. Alex Ross has included both Cat-Man and Kitten in his Project SuperPowers series which utilizes forgotten characters from defunct publishers, with Cat-Man becoming a feral cat-creature now called "Man-Cat". Kitten, thankfully didn't share that fate. We've also revived the originals on a line of kool kollectibles including a 12-month calendar, t-shirts, mugs, and other goodies! Cat-Man's got a new lease on life! Let's see how long it lasts. *While the renamed book carried a cover numbering from #1 on, the indicia listed it as #6 on, continuing the Crash Comics numbering so the publisher could continue to use the 2nd Class Mail license issued for Crash! (The licenses were expensive, and publishers had to purchase a new one for each new title they published!) 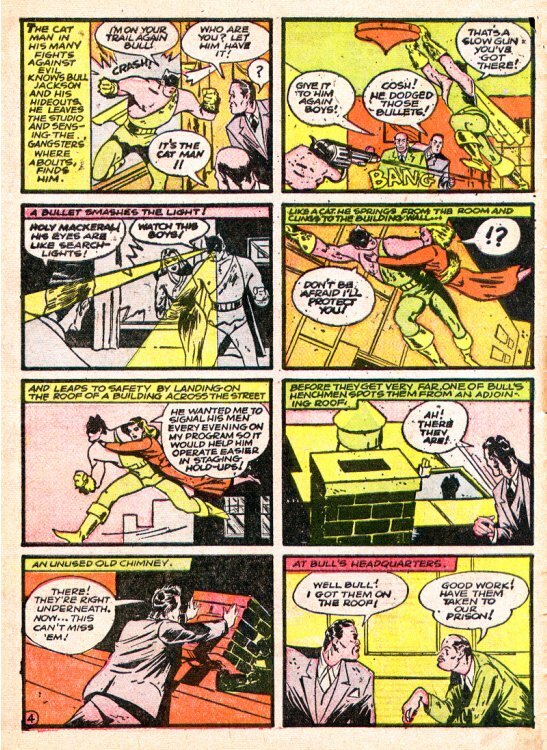 It's also why Amazing-Man Comics, began at #5, continuing the numbering from it's predecessor, Motion Picture Funnies Weekly! 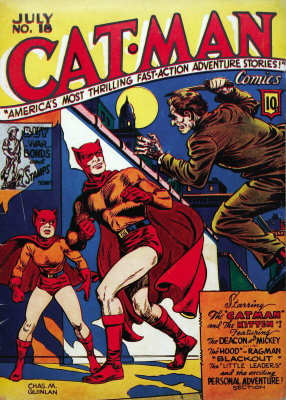 That's fascinating, I'd heard of Catman and Kitten but didn't know the details. That page 2 text panel is working so very, very hard. 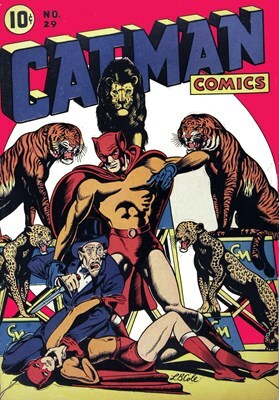 And how scary is Catman's upper body in the origin, it's out of control! 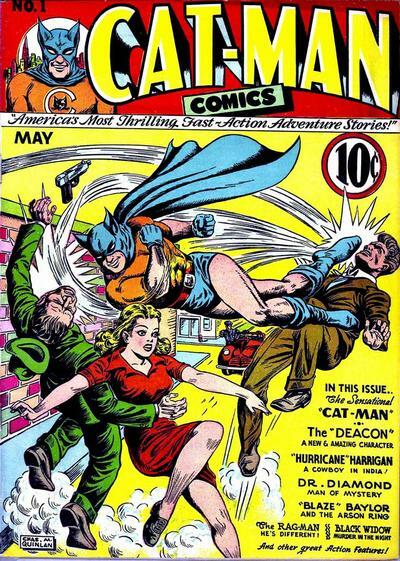 It's interesting - if meaningless - to note that the #18 cover trumpets a character named Ragdoll, given DC's Catman being on a team with a character of the same name.